Apple released the iPhone 8 and iPhone 8 Plus on Friday, September 22, and device teardowns were underway within hours, courtesy of iFixit and TechInsights. The firms received different models for teardown, with iFixit's model featuring a Qualcomm baseband while TechInsights' featured an Intel modem, continuing Apple's trend of opting for Intel modems in phones which do not require CDMA network support. The baseband parts in each iPhone were revealed to be new chips from their respective vendors, with the CDMA phone featuring Qualcomm's new X16 gigabit-class modem and the Intel-based model featuring the similarly new XMM 7480 modem. Each model also included an update to the transceiver module to go along with the modem, but the functional changes in the RF signal chain mostly stopped there. In addition to higher peak speeds compared to their predecessors, both of these modems offer other potential benefits. Comparing the network compatibility pages of the iPhone 7 against the iPhone 8 shows that the bands supported are largely unchanged, and this is reflected in the small changes to the power amplifier modules (PAMs) found within the RF chain. 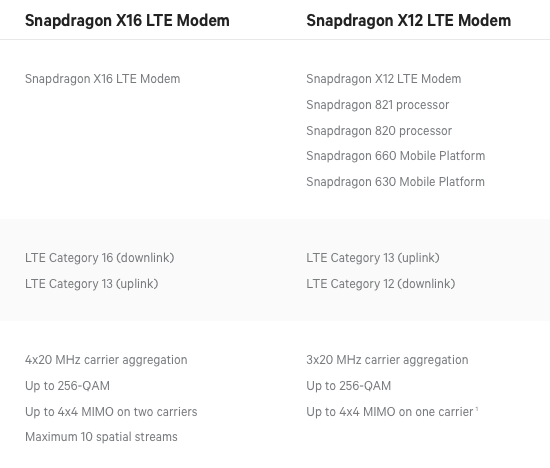 Besides gigabit-level peak theoretical speeds, the X16 modem brings several other advances, including up to 4x carrier aggregation for a total bandwidth of up to 80 MHz compared to the 60 MHz found in the MDM9645M (X12) powering the iPhone 7. 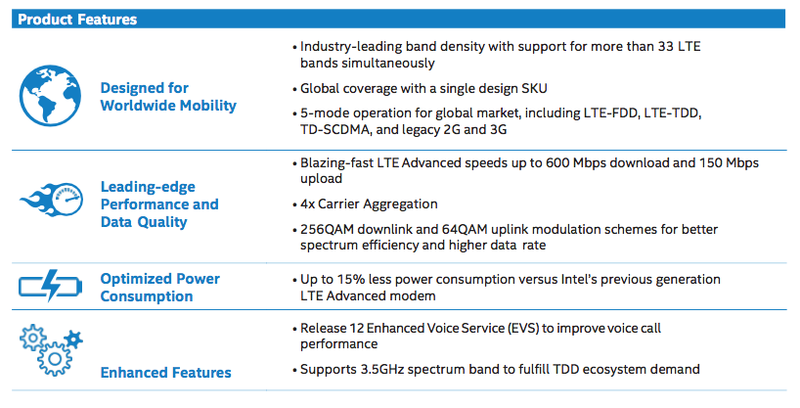 Qualcomm's X16 modem also supports T-Mobile US's new 600 MHz LTE spectrum, Band 71. Apple does not list support for Band 71 on the model sold for use on T-Mobile, which means that either Intel's modem does not support it for the appropriate T-Mobile model or Apple elected not to include support for it in the phone's antenna/PAM structure. The Intel XMM 7480, by contrast, only has a maximum theoretical peak of 600 Mbps, and while it also supports up to 4x carrier aggregation, two of these channels are limited to 10 MHz, capping overall bandwidth at 60 MHz. Intel has boosted its band support to a total of more than 33, claiming an industry leading number, but there are likely other deficiencies compared to the Qualcomm modem which have been accepted due to Apple's desire to have supplier diversity for this component. Regardless, it is clear that both of these modems are improvements over their predecessors, yet Apple dedicated no time to talking about advanced cellular capabilities for any of its phones in the media event earlier this month. Instead, the main reason for upgrading to these new modems likely lies in power consumption. The teardowns have revealed that Apple has reduced the size of the batteries in the iPhone 8 lineup while maintaining battery life claims across the board. The squeeze on the iPhone X will be even worse, given Apple's claims of iPhone 8 Plus-like battery life in a non-Plus type form factor. While there are several other advancements likely behind the scenes there, it seems clear Apple wanted to get more efficient in its cellular radio chains. This will also be an area to watch in the iPhone X, as the cellular RF chain is one of the biggest consumers of space in the phone. According to its spec page, the iPhone X will support the same bands across two models as its 8-branded brethren, so space may have to come from elsewhere. The advancements in baseband modem power efficiency likely come from two different sources for Qualcomm and Intel. The X16 is built on a 14nm FinFET process according to Qualcomm, which likely has several advantages over the 28nm RF process utilized in its previous modems. Intel, on the other hand, claims up to 15 percent lower power usage compared to its previous-generation modem, which could be thanks in part to the newly included envelope tracker for voltage control, which reduces power usage and heat. While it is not clear which process Intel's modem is built on, it seems likely it is still a 28nm process from TSMC, as Intel still works on the technology lineage from its Infineon acquisition. Nevertheless, future iPhones will be well-positioned to include higher bandwidth and more diverse network capabilities in the future, even if the modems they use stay the same. It’s wrong for Apple not to have talked about this in the keynote like every other year, or mention it in their website. People deserve to know the specifics. Apple never gives the specifics in their keynotes. 99% of people don't care, and their eyes glaze over with boredom. Here we go again. Modem-gate. If you want better hardware go Samsung, if you want a better experience go iPhone. What in the world does that have to do with anything. For me it’s not headline speed that matters as none of our networks come close to maxing either modem out in terms of speed. The real question is which of the 2 is better at holding on to that last scrap of 4G signal when you are right on the edge of the range and which modem can extract the most speed out of that tiny scrap of signal. The carriers are not coming close to maxing either of these modems out, so I suspect it just does not matter to 99.99% of iPhone buyers. It's not about maxing out the modem. Most users are operating under weak to moderate signal conditions in buildings or underground. The situation is similar to 802.11ac. The goal is get 100Mbps throughput under real world conditions, not the 1.3Gbps marketing spec. Last year, Apple employee refused to sell me a Verizon model (on their installment plan) because I am on ATT, but am NOT under contract. At the time, I just wanted to leave my options open to switch carriers, so I wanted the more universal phone. I can honestly say that my Intel iPhone 7 has had the worst signal strength of any cell phone I’ve ever used, going back to the days of Nokia candybar phones. I have no service in any large store (Wal-Mart, Target, local grocery store). I am completely reliant on their WiFi now. I get 1 dot/bar in my house and people complain that I’m cutting out until I go outside. I live 15 minutes from Disney World, surrounded by vacation rental properties, it’s not like this is a rural area. I just want to switch carriers at this point to hopefully get a decent signal, but I can’t switch to Verizon for the same reason I have such crappy reception in the first place. Is this an official Apple policy? If I’m not on contract with any carrier, can I use Apple’s upgrade installment program to upgrade to the 8 by getting the Qualcomm (Verizon) model, but activate it on ATT? As I said, last time they insisted on activating in store and made me take an ATT phone. My experience echoes yours. This time around I went with the unlocked sim-free which has the superior Qualcomm modem. (I know as it supports CDMA which Intel doesn't). My wife, who's stuck on ATT NEXT program went with the default Intel ATT model. I know it's anecdotal only, but in rural areas around here, her Intel 8+ will more readily drop to 4G reception to maintain signal, whilst my sim-free 8+ is still chugging around 1-2 bars on LTE. The max speeds near towers are about the same though so urban users might not notice the difference as much. Apple takes improvements in design/efficiency etc. to shrink size of devices or other sort of things. Samsung just plops in the largest and best chips/batteries/etc. it can into into its square boxes for spec hunters. Just my opinion. Others are welcome to their own of course. Well IMO decreasing battery size because a chip became more efficient is the wrong way to do it. Why be just as good as before? Why not better? God forbid Apple keep the same size battery AND enjoy new modems efficiency. If I understand correctly, all iPhone 8 come with a slot for SIM card. So a SIM-free phone just means the SIM card is not in the slot. Then, what's the difference between a SIM-free and one with SIM card phone? With previous iPhones, most retailers just stocked iPhones that were specifically tied to the carrier they were being purchased for. This meant having a ton of inventory. At Best Buy, iPhone 6 and SE still come for specific carriers, with the ICCID barcode on the box and SIM installed in the phone (except AT&T, which for some reason never has the SIM physically installed in the phone). iPhone 6s/6s Plus, 7/7 Plus, and 8/8+ are all ‘universal’ and thus do not come with an included SIM and are only locked to a carrier if an installment billing agreement is drawn up. Same can be said of recent cellular and WiFi models of iPad. I’m just not certain which model iPad Best Buy started selling ‘universal’ SKUs. It has been a major improvement for Best Buy, as it means less inventory complexities and customer disappoints, especially when the devices are new and harder to come by. You used to run into problems where a customer wanted say, Sprint, but the only phone in the color and size they wanted was on AT&T. In that situation, you either had to order the phone, or the customer left and went elsewhere. With the ‘universal’ SKUs, you grab the color and size you want, grab a SIM for their carrier, and go. With the ‘universal’ SKUs, a customer can either buy the phone on installments, which locks the phone to that carrier until paid off, or they purchase the phone outright and it’s not locked to a carrier. Best Buy only sells the Qualcomm iPhone 6s/7/8 series, which means there’s no compatibility issues if you want to switch carriers down the road. The US Sim free phone works on every carrier that an iPhone will work on in North America. Edit: in the US. No idea what Europe does.